In the bowl of a stand mixer cream together the butter and sugar for 3 minutes. Add the eggs and vanilla and blend until smooth. Slowly mix in the flour, baking soda, baking powder and salt just until combined. Remove the dough from the bowl, wrap in plastic wrap and refrigerate for one hour. Roll dough out on a floured surface to 1/4 inch thickness. Use a 3-inch round cookie cutter to cut dough into 15 circles. Using a straw, cut a small circle at the bottom of each circle, about 1/2-inch from the edge. This will be the hole for the golf green. Lightly spray your temp-tations Lid-It® with non-stick spray and lay your cookies on it. You will need to bake in two batches. Bake for 12 - 15 minutes or until golden brown. Cool completely before removing from Lid-It®. For the icing: Place the egg whites in the bowl of a stand mixer and whip until frothy, about 3 minutes. Gradually add the powdered sugar and whip until smooth. The icing will be a little runny. Take 3/4 of the icing and put in a small bowl and mix with green coloring. Split the remaining icing between 3 small bowls. Add yellow coloring to one, red coloring to one and leave one white. Mix each bowl well. Cover each bowl with a damp paper towel to prevent it from hardening. Spread the green icing on top of each cookie. Clear the small hole of excess icing so you can still see it. 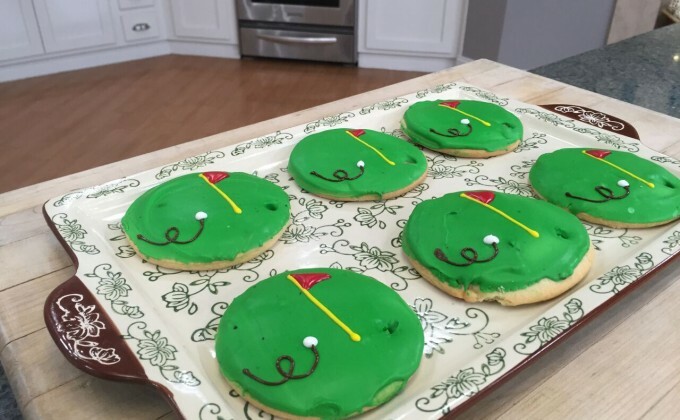 With the cookies in front of you on the counter, line them up with the golf hole at the 4:00 position. To make the pole, place the yellow icing in a pastry bag with a small tip. Pipe a straight vertical line about 2 inches long starting just to the left of the hole, going almost to the top of the cookie. To make the flag, place the red icing in a pastry bag with a small tip. Make a small triangle at the top of the pole with the tip going to the right side of the cookie. To make the "swoosh" decoration, melt the chocolate in the microwave until smooth. Place in a pastry bag with a small tip. Starting at the 9:00 position, make a little design to accent the golf ball. To make the ball, place the white icing in a pastry bag with a small tip. Put a small round at the end of the curly q decoration. Allow to dry for a couple of hours or overnight before serving.